Revamp Your Wood Floors in Cleveland Heights Today! Don’t get frustrated searching for the best hardwood floor refinishing Cleveland Heights, OH has to offer. Read below and learn how Fabulous Floors makes homes shine in Cleveland Heights! Have the Hardwood Floors You’ve Always Wanted in Cleveland Heights! You don’t have to entirely replace your hardwood floors to make them look new again! Hardwood floor refinishing in Cleveland Heights from your friends at Fabulous Floors can restore the beauty of your floors! Fabulous Floors Cleveland is your trusted source for hardwood floor refinishing in Cleveland Heights and the surrounding areas. Before you go through the financial and time-consuming cost of completely replacing your hardwood floors, let us show you how you can get the floors you want without the huge time and financial commitment. The service offered Fabulous Floors Cleveland in Cleveland Heights, OH is unmatched! Our friendly technicians will answer all your questions and make the whole process simple and stress-free for you. 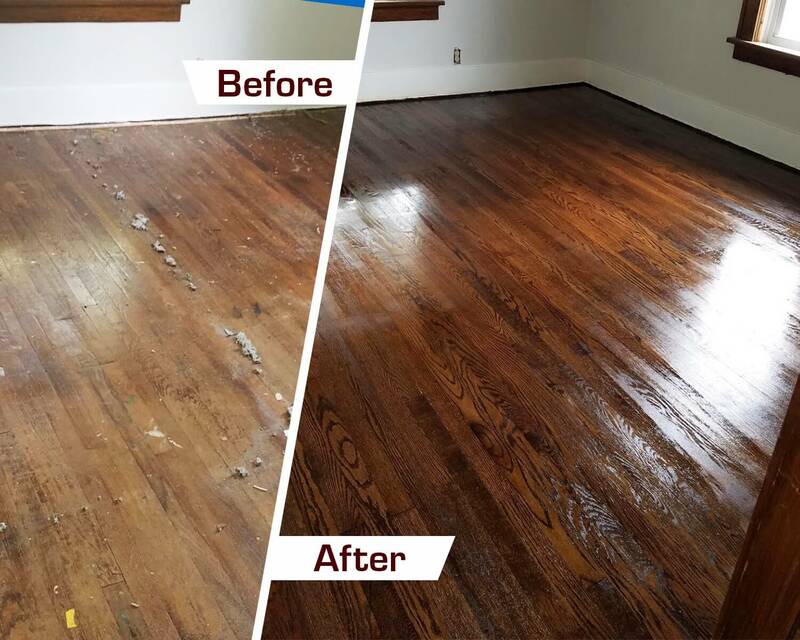 Contact us today to see what our hardwood floor refinishing services in Cleveland Heights can do for your home! Sometimes, when you remove the carpets in your home, hardwood floors will reveal themselves below and we can easily restore them for you. We will carefully scrape away the bonded pads of your carpet, taking care not to damage the wood. We also removed leftover staples with a chemical solvent. Removing the carpet enables us to begin the refinishing process. Our technicians are trained to provide a dustless sanding process that prevents any mess or discomfort for your family. We first sand with the coarsest sandpaper and repeat the process three times, using a finer grit each time. We hand sand those hard to reach areas to complete the process. The stain color of your choice is applied evenly, in a circular motion. We repeat this process until the desired color is achieved. After the stain dries, we buff the wood and use a tack cloth to clear any dust or debris. Your beautiful hardwood floors are then ready to receive a polyurethane finish. A polyurethane finish protects your floors from everyday traffic and helps them stay beautiful longer. We apply the polyurethane in even coats using a special mop-like tool that spreads the coat as accurately as possible. After 24 hours your floors will be dry and look as good as new! With routine maintenance and cleaning, you will be able to preserve the beauty of your floors for years to come.